The analog multimeters provide measurement in analog form. The digital multimeters provide measurement in digital form. 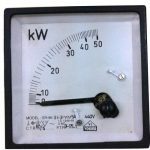 Power supply is not required in analog multimeters. 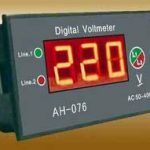 Power supply is required in digital multimeters. The output cannot be interfaced with external equipment. The output can be interfaced with external equipment. Construction is simple. Construction is complicated. The analog multimeters size is bigger as compared to digital multimeters. 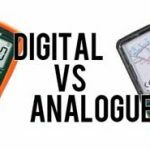 The digital multimeters size is small as compared to analog multimeters. Better visual indication of changes in the reading is obtained. Visual indication of changes in the reading is not that much better. The analog multimeter is less suffered from electric noise. 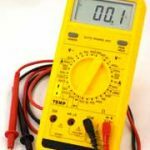 The digital multimeter is more suffered from electric noise. It does not require ADC converter i.e. analog to digital converter. It requires ADC converter and quantity to be displayed is in digital form. Accuracy is less. High accuracy is obtained.